Each individual claiming UI benefits will be mailed a monetary record. Even though the individual may have earned qualifying wages, additional requirements must be met and maintained to receive UI benefits. Carefully review all information on the monetary record. Contact IWD immediately or send a letter appealing the monetary record if any information is incorrect. The appeal should include copies of any check stubs, W-2 forms or other proof of earnings, if available. The benefit year is a one year period from the claim effective date. Benefits may be paid on a claim until the MBA is exhausted or the benefit year ends, whichever comes first. The UI claim expires at the end of the benefit year, even if all funds have not been paid. If the MBA is exhausted before the claim expires, the individual must wait until the end of the benefit year before filing a new claim. The base period is a four quarter (one year) time frame using the first four of the last five completed calendar quarters at the time an initial UI claim is filed. Qualified earnings in the base period determine the WBA and MBA. Earnings received in the current and most recent quarter are not used to determine monetary eligibility. 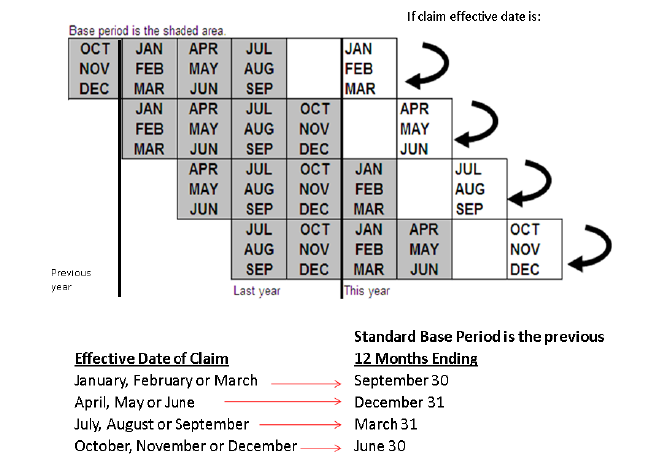 EXAMPLE: If a new claim is filed in April, May, or June (second quarter) of this year, the base period is January 1 through December 31 of last year. If an individual fails to qualify monetarily using the regular base period, it may be possible to use an Alternate Base Period (ABP). To request ABP or additional information, contact IWD. The number of dependents is used to determine the WBA and MBA. Adding dependents will increase the WBA and may increase the MBA. A dependent is any individual who was claimed on the prior year’s income tax return. A claim may include a maximum of four identity verified dependents. Non-verified dependents will not be added to the claim. Dependents can only be added within 10 days of filing the initial claim. A spouse may be considered a dependent if they earned $120.00 or less in wages (excluding self-employment) during the week before the claim effective date. Dependents claimed incorrectly may result in an overpayment. The WBA is determined by the wages in the high quarter of the base period and by the number of dependents claimed (up to a maximum of four). The minimum and maximum WBAs change each year for new claims filed after the first Sunday in July. The MBA is either 26 times the WBA or one-third of the total base period wages, whichever is less. If the individual’s last employer permanently closed the business location, the MBA may be increased. The MBA will be either 39 times the WBA or one-half the total base period wages, whichever is less. The WBA will not change. To be eligible for a second claim year, individuals must earn wages in covered employment of at least eight times their weekly benefit amount since the effective date of their previous unemployment claim. Second benefit year claims can still be filed even if eight times the weekly benefit has not been earned. After the eight times the weekly benefit amount of the previous claim year has been earned, individuals should contact IWD Customer Service.